Enter through the main entrance of the Blacktown Workers Club and make your way to the reception desk. The receptionist will direct you to the training room. CAR – Parking is available onsite. There is a 30 minute lunch break for courses running over 4 hours. No external food allowed. Alternatively, there is food options available onsite. In a suburb as busy as Blacktown, any number of unexpected incidents can happen within area. With anything from asthma attacks to workplace accidents, it really pays to be prepared for any eventuality. This is why one of the most invaluable skills you can learn while living in Blacktown is first aid. Australia Wide First Aid is one of the leaders in quality first aid training throughout the country. We are a recognised Registered Training Organisation (RTO No. 31961) that offers both online courses as well as face-to-face courses in convenient training centres across Australia. This structure of blended learning allows us to deliver on-demand training for students looking to acquire the skills and knowledge to provide first aid to those in need. Our team of highly professional trainers and assessors is backed up with various industry experts to ensure that the training that we give is of the highest quality and meets all the required standards. All our courses are in accordance to the guidelines set by the Australian and New Zealand Committee on Resuscitation (ANZCOR). Due to this, each course completed by our students is recognised and accredited throughout the country. Our training facility in Blacktown has a relaxed atmosphere, which allows liquor and gaming on the premises. We still take our commitment to first aid very seriously and make sure to separate the training area to allow for a focused learning environment. Upon the completion of any course, a Statement of Attainment will be emailed to the student within the same day. Training courses are organised at the Blacktown Workers Club, where one of our friendly receptionists will inform you of where the actual training course will be held. Parking is readily available at the site and commuting is relatively easy, with the Blacktown Train Station just a ten minute walk away and the bus stop just 250 meters from the Blacktown Workers Club. First aid is the simple act of providing assistance to a sick or injured individual until professional help can arrive and take the patient to a medical facility that can provide full health care. 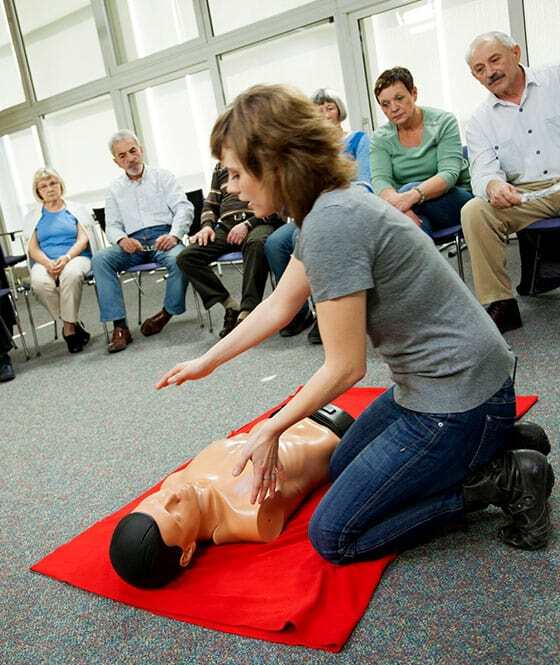 First aid covers a wide breadth of skills and competencies, with anything from basic hygiene to more complex skills like Cardiopulmonary Resuscitation (CPR). Australia Wide First Aid offers various types of first aid courses, allowing students to be prepared for most emergency situations and know how to handle them when the time comes. Why Is It Important to Learn First Aid? The sudden occurrence of a medical situation makes it imperative for people to have the skill to provide first aid at a moment’s notice. However, it’s important to understand that first aid covers skills that are more than simply dressing a wound or alleviating pain. It can also apply to skills such as the correct way to provide basic life support or how to administer an auto-injector (Epi-Pen) properly when someone is suffering from an anaphylactic attack. Australia Wide First Aid has training classes that cater to a wide variety of situations with its various short courses on first aid. Most of these courses only take a few hours to complete and they can impart students with the necessary skills to provide first aid in the correct manner. All training received is nationally recognised and can be applied in any workplace or community setting. Many organisations impose various safety regulations that companies need to adhere to in their respective workplace. Groups like the Australian Children’s Education and Care Quality Authority (ACECQA) require some employees working in specific conditions to be trained in various safety procedures in case of a workplace accident. For instance, those working in the electrical sector need to know what to do in case an individual needs to be rescued from a live LV panel accident. Similarly, an employee suffering from an asthma attack might need assistance from their fellow co-worker, who can then apply the proper first aid procedures to help that person. Workplace safety is a serious issue that we at Australia Wide First Aid understand. This is why many of our courses specifically focus on the workplace setting. We have training courses such as Emergency First Aid that specifically covers the workplace and what employees need to do in order to address any incident. The completion of these courses is in full compliance with the guidelines set by various safety organisations. Those who want to take an express course must provide proof that it is not their first time to enrol in the same course. 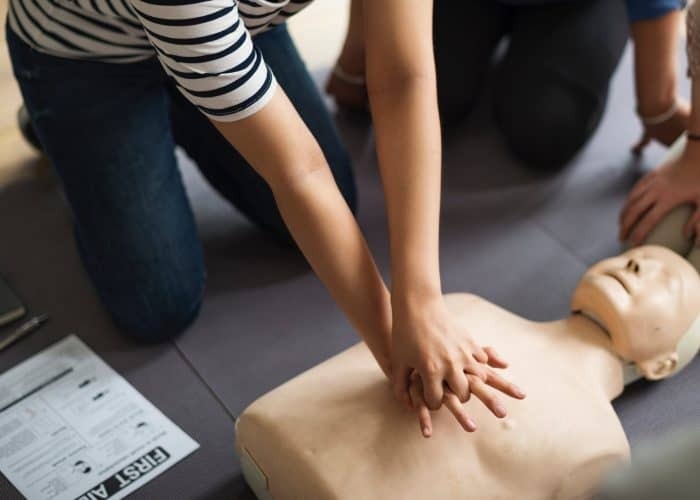 For students who are interested in taking Provide First Aid and CPR courses, they will also be required to undertake and complete all pre-course readings and E-learning assessments by 11:59 AEST on the day before the course. Failure to achieve a 100% satisfactory outcome rating to the pre-course assessment will make them ineligible to attend face-to-face training. It’s still possible to reschedule the course with a $22.00 rebooking fee by contacting our Head Office. Australia Wide First Aid values human life above all else. This is why it strives to share its knowledge of first aid to everyone, so that those who need it can receive the proper care necessary during an emergency situation. If you want to learn about first aid, feel free to call us at 1300 336 613 or leave us an inquiry on our Contact Us page. Australia Wide First Aid's Blacktown Courses have been rated 4.5 out of 5 by attendees based on 78 recent reviews.